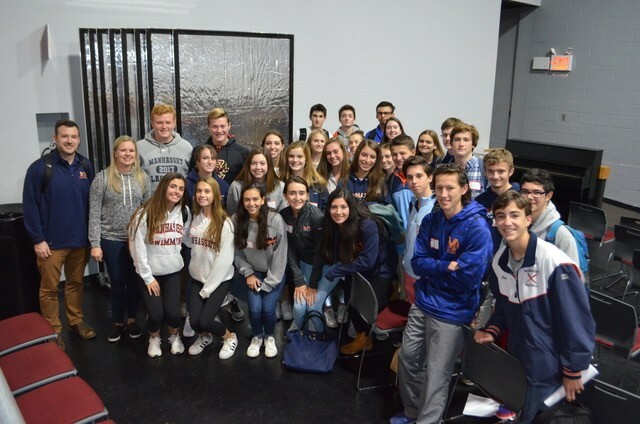 Thanks to partial funding from the Manhasset Community Fund, the inaugural Student Athlete Leadership Team at Manhasset High School has been providing valuable lessons in the sixth grade classrooms of Munsey Park and Shelter Rock Schools. Thirty-three 10th and 11th graders, having been selected after a competitive application process, attended training in the Athletes Helping Athletes curriculum at Molloy College. Professional athletes and sports commentators teach the student-athletes ice-breaker activities and public speaking techniques that they combine with personal stories to show the importance of perseverance, appreciating individual strengths and skills, good sportsmanship, preventing bullying, and avoiding alcohol and drugs. One of the team advisors, Lauren Sadeh, can attest to the value of this mentoring experience, as she was a student-athlete leader herself at Commack High School. Ms. Sadeh teaches tenth grade Health and coaches Varsity Girls Basketball. Nick Armstrong, 8th grade Social Studies teacher and assistant coach of Varsity Boys Lacrosse, is the other advisor guiding the team. Student-athletes have enjoyed the admiration of their sixth grade audiences as well as their former teachers. Together with Athletic Director Jim Amen and the other coaches they hope to empower students to resist alcohol and drugs and reach their full potential. Team members pledge, with the support of their parents, to remain substance-free. With the leadership of these student-athletes, we hope to change the favorability of underage drinking. Approval of underage drinking can lead to binge drinking, experimenting with other drugs, taking uncharacteristic risks, poor academic and athletic performance, and addiction. Applications for next year’s Student Athlete Leadership Team will be available to current ninth and tenth graders in the Athletic Department in April.